Izhar Patkin: The Wandering Veil is a survey of works by the Israeli-born, New York-based artist Izhar Patkin. 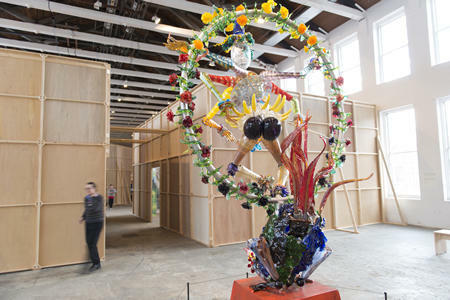 The show is currently on display at MASS MoCA in North Adams, MA - filling their largest gallery space with works from Patkin’s 30-year career. Izhar Patkin "Where Each is Both"
Izhar Patkin discusses his Shiva sculpture, "Where Each is Both"
The exhibition is grand and labyrinthine - but also surprisingly intimate - it’s rich with personal narrative, political metaphor, and myth. 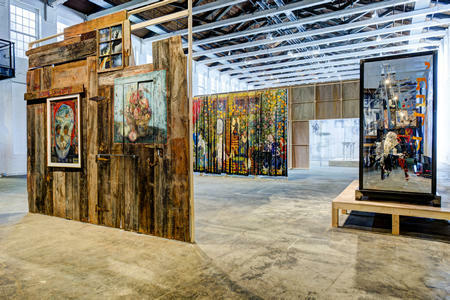 Izhar Patkin: The Wandering Veil will be on view at MASS MoCA through September 1. The opening reception is this Saturday, January 18. There will be an Artist Talk - Izhar Patkin with David Ross at 2pm. 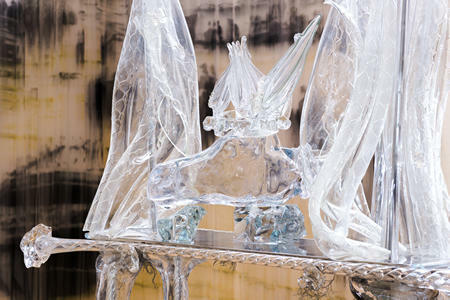 Izhar Patkin "The Messiah's GlAss"
Izhar Patkins discusses "The Messiah's GlAss"
One of the MASS MoCA's current exhibitions is Jason Middlebrook: My Landscape. The pieces contained include new works from Jason’s series of painted hardwood planks begun in 2008 and will debut an awe-inspiring, hanging mobile that functions like a fountain within the gallery. Weather Event from the Burchfield Penney Art Center is now on display at The New York State Museum through February 23, 2014 in the West Gallery at the NYS Museum. Weather Event focuses on Charles Burchfield’s depictions of the weather south of Lake Erie, where the artist lived for most of his life. Individual weather events are examined through both an artistic and scientific lens. The exhibition presents the dramatic and complex natural phenomenon chronicled in more than 50 years of Burchfield's writings, drawings and paintings. To tell us more – we welcome Mark Schaming, Director of New York State Museum, Anthony Bannon, Director of the Burchfield Penney Art Center, and Tullis Johnson, Curator and Manager of Archives at the Burchfield Penney Art Center. "GO: A Kidd's Guide To Graphic Design"
Chip Kidd is “the closest thing to a rock star” in the design world (USA Today), and in Go he explains not just the elements of design, including form, line, color, scale, typography, and more, but most important, how to use those elements in creative ways. He explains the difference between vertical lines and horizontal lines. The effect of cropping a picture to make it beautiful—or, cropping it even more to make it mysterious and compelling. How different colors signify different moods. The art of typography, including serifs and sans serifs, kerning and leading. The Samuel Dorsky Museum of Art at the State University of New York, New Paltz currently presents Anonymous, an exhibition of contemporary Tibetan art featuring over 50 works of painting, sculpture, installation, and video art by 27 artists living in Tibet and in diaspora. The show will be open through December 15th. The exhibition was curated by Rachel Perera Weingeist, Senior Advisor to the Shelley & Donald Rubin Foundation, the exhibition is largely drawn from the Rubins’ private collection. Rachel joins us now to tell us more. Next week, The Samuel Dorsky Museum presents Tibetan Arts Week, a series of public programs and discussions with leading artists and scholars. Oh, Canada opens with a big party at MASS MoCA on Saturday at 6pm. The exhibition features more than 100 pieces from 62 contemporary Canadian artists from every corner of the nation to our north. Curator, Denise Markonish, takes us on an a tour of the exhibition - which - as we walked through was still in the process of being installed. Williamstown, MA – David Breslin, guest currator of the El Anatsui show at The Clark, takes Sarah on an audio tour of the exhibition.